blakesMOTO2019 - new york gotta pay to play! "I was riding with Alpinestars Fluid Pro braces which were great! I recomend them to any caliber rider. But it was time for a new set.... I purchased Asterics Cell brace which were comfortable. I then tried on the Mobius which were everything I expected from such a product! Well built and comfortable. the reason I went with the X8 instead of the Cell 2.0 was comfort, the X8 felt a little better during Motos. 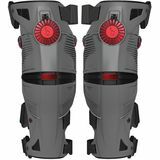 PS i would order similar to what size clothes you wear, L get a L, M get a M ect....."
Team Gapcoffee - Bangor PA Tough Racer Family recommends 100% "We have been using Mobius braces for several years now. The fact is, even with 2 AA riders and a B rider, we wouldn't wear anything else. Every year, I get a refurb kit and make them like new. The guys at Mobius are top notch. I can't thank them enough for their service and their know how. We love our Mobius. We really do."